Coral Cay is a volunteering organization that offers places in marine and forest expeditions to remote areas. Diving was the most interesting part of the option that I chose. Basically, the purpose of the expedition was mapping shallow areas around the island, recording biodiversity, and the reef damage. Volunteers would do the underwater survey part. 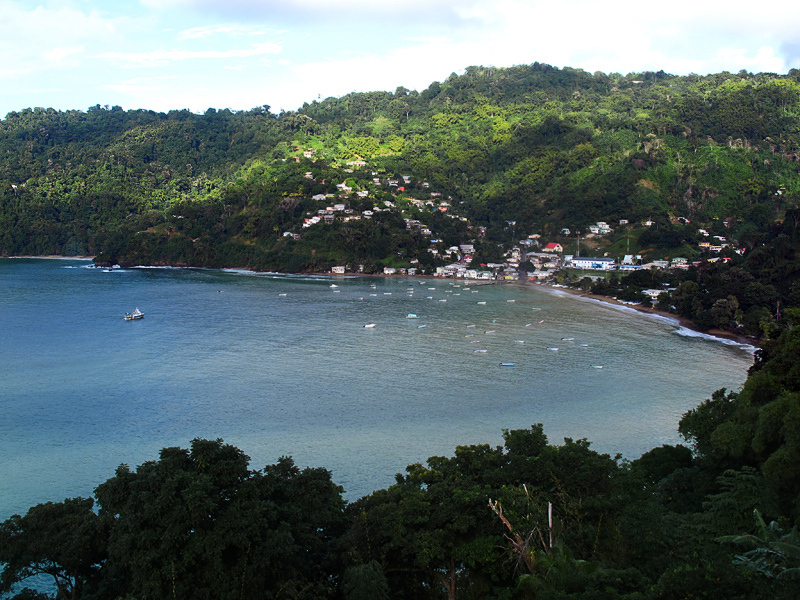 The expedition base was on the north part of the island in the fishing village Charlotteville. Basically, Coral Cay has only one cottage and sometimes rents a second one. When I came, there was only one volunteer on site and everyone else was a staff member. The house is right on the beach with an amazing view towards the bay and the village. It became my home for the rest of the stay. Like I said, sometimes second house is rented. But that happens only if the main cottage, that is designed for one family, gets filled up to the point when you wouldn't even have place under beds and tables. Coral Cay is very good at money saving and the tiny house can be filled with more than 16 people. Since you spend little time in the rooms, it's generally not an issue. When you come as a slave volunteer you have a long training, which consists of dive courses and science training. You need to be a PADI Advanced Open Water diver by the time you start learning about marine life. The science development programme consists of learning hundreds of species of fish, some dozens of corals, coral diseases, and invertebrates. Fish is divided into commercial and demersal and you learn those groups separately. To pass the training you need to take exams (computer based) and then you have pointies (basically someone showing you and naming species underwater), and only then you have underwater validations. Gosh, all those corals look the same the first time you try! And when you are "validated" and you can easily pretend that you recognize all species and coral diseases, you learn transect line survey techniques. You learn how to count fish, corals, and invertebrates. Then you fill this data into the database upon accomplishing every dive. After two weeks of training regular life starts and you can "relax". A regular day would start at 6 in the morning and ends when you lose your consciousness. Officially at 10 p.m.
You have a brief breakfast followed by staff announcements and then you kit up... assembling and disassembling of scuba gear takes a lot of time. But kitting up should be as fast as possible as we make boat dives. We need to load the boat with a lot of things: medical equipment, including oxygen, spare dive gear, water, SMBs, and survey equipment. Who is not afraid of getting wet? Why loading the boat every day? To create extra job for volunteers! Because we keep the equipment on land for various safety reasons. Yeah, getting wet to get on the boat! Then we had to follow GPS coordinates to find the dive site. I love those rides, 250horsepower engines and rough see can give you a real shake! Sometimes the ride would take 20 something minutes one way. After a dive you are supposed to get back on the boat... and sometimes it has to be done in the rough see and in the currents. A few times it was quite hard and took about an hour (!) to have everyone on the boat. A person on the boat helps pulling out the gear before you can get in. No ladders... you get on the boat by means of kicking. After a dive you wash your kit and then kit up again waiting for the afternoon dive! Diving and kitting up is not everything you do at the site: everyone is responsible for maintaining it. So we had chore list and knew what we were doing--cooking or cleaning. Staff members in addition had to fill up tanks. The car on the left picture can be easily filled with 6 people not including the back=)Coral Cay loves making things tight. On the right pic you can see that the boat is by a pier: makes the life so much easier, but the entire process of moving across the islands adds stress. That's what a regular day on Tobago looked like. Occasionally we had weekends. Saturday nights were for getting tanked parties, otherwise they were regular days. May be even including a night dive. Sundays were dive-free days. And also in-depth cleaning days! Really seldom we had organized excursions, so I had to explore around on my own. Coral Cay food requires a special mention. I think that it makes people really inventive. Imagine you have 20 exceptionally hungry people, meal time in two hours, and you are on dinner. And of course, you have a wide range of various ingredients like noodles, spaghetti, split peas, beans, pigeon peas, onions, garlic, and on lucky day carrots and may be even tomatoes! What a choice... and you should not be concerned about proteins: I guess you get enough by consuming ants constantly infesting sugar, or may be you learn how to generate proteins just thinking about meat. I think with the help of our dogs we hunted down every single chicken within our neighborhood. Actually the food situation got much better towards the end of my stay and we had meat more than two times a week, and in other Coral Cay sites it's not bad at all. Besides, you could buy your own food. One of our dogs (Stinky) on duty, ready to find something to bark at! Coral Cay has strict rules for volunteers and they are not only related to diving. You could not leave the site without permission from the expedition leader, or leave the site alone, or leave it after dark without a staff member, and couldn't officially do a lot of other things like smoking weed. Regarding diving you have strict profiles, like maximum depth 18 meters and maximum time 43 minutes. The dive limits tighten up as the day progresses and you have only two dives a day that gotta be at least 3 hours apart. At the end of October we had a hurricane and our boat sank and we had to pull it out. In addition to the normal routine you can take Dive rescue and Divemaster courses and Emergency First Response as well. Divemaster course was quite a challenge in terms of fitting the training into the daily schedule, as you have to get ready for divemaster exams, assist in dive training of new volunteers and so on. Tobago itself is an amazing place. I loved the way villages are integrated into the landscape: everything is around the ocean. It feels like rare tourists are mostly coming by ships and yachts. The island has few hotels for a place like that, people prefer renting houses. Even though I grew up on tropical islands local people and culture seemed very unusual to me, so bad I missed the carnival. 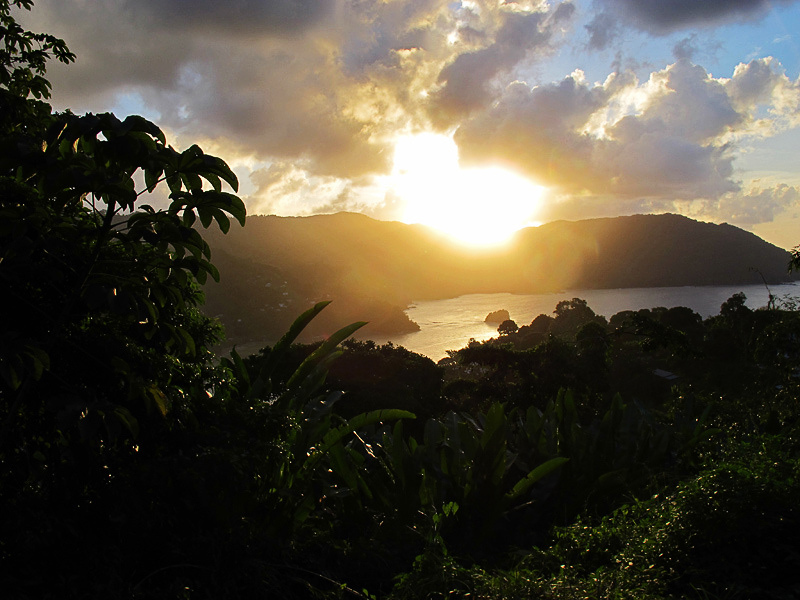 And what mesmerizing sunsets and nights Tobago has! The most impressive were fireflies. Thousands of them sitting in trees like christmas tree lights and flying around and illuminating jungles. Sunrises were colourful too. It's impossible to sum up a 5 month long experience with one post, so I'll conclude with a picture gallery and saying that it was a brilliant way of getting out of regular life, seeing people nearly killing themselves to make some contribution into conservation and doing it without thinking about money and getting profit, but because they care. It was important seeing how fragile and beautiful the world around us is.